A optional external cover for further-spill resistant and dust proof. 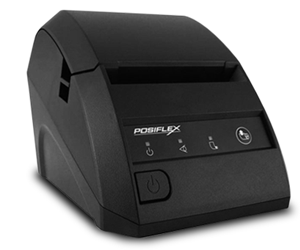 Posiflex Aura-6800 series is an easy loading, low noise, high resolution, lightweight; high reliability and high performance thermal printer. Additionally, clearing a paper jam in the Posiflex Aura-6800 series printer is an easiest thing. The paper jams (in most cases) can be solving by push the “Hood Release Button” directly. Cash drawer control up to 2 cash drawers. Fast-speed printing (150mm per second). Supports application environment of Windows or OPOS or Linux. 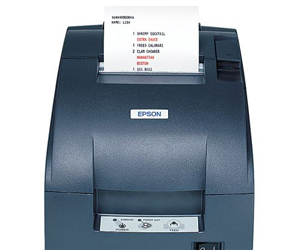 Epson TM-T88IV offers 25% faster printing speed of up to 7.9" per second than its predecessor. Now with 200mm per second print speed, you can increase your business efficiency by reducing customer waiting time and improving customer satisfaction. 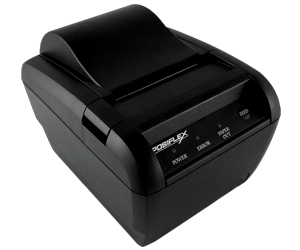 You can now print your company logos and even graphics on the receipt roll with the enhanced graphic capability. 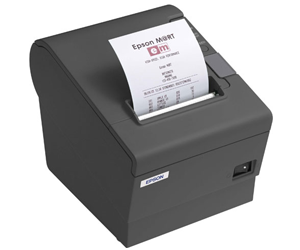 Epson TM-T88IV small footprint and designed case makes it ideal for all retail and hospitality environments. The robust casing improved spill resistant and added durability to withstand demanding environment. With the optional bracket, Epson TM-T88IV can be wall mounted to further save space.